When you back up your iOS device using iTunes on a desktop or laptop computer all of the paintings you have created in ArtRage will also be backed up, along with any custom resources such as presets you create. This means that when you restore your device, all your content should also be installed. You can also Export entire Groups of paintings to any of the standard export locations on your iOS device, including apps that support cloud services such as iCloud Drive, by tapping the Menu button to the right of the Group you want to export in the Gallery and selecting the ‘Export Group’ option. Does ArtRage for iOS Support iCloud Drive? Yes! ArtRage for iOS lets you share files via iCloud Drive using Import and Export options. The app also supports the iOS Files app which allows you to share your files with other apps on your device including apps that provide cloud services. Link to this item: Does ArtRage for iOS Support iCloud Drive? How do I Import, Export, and Share Images (iOS / Android)? If you are currently painting tap the ArtRage logo button on the ArtRage toolbar and go to your Gallery using the option in the menu that appears. Tap the + button at the top right of the Gallery screen. Select one of the three Import options in the menu. The ‘Import Files’ option opens a file location browser for you to import files from standard locations on your iPad or from cloud services you have installed such as Dropbox. The ‘Import from Photo Library’ option allows you to import an image from your iPad Photos app. The ‘Import a New Photo’ option allows you to take a new photo and import that. When you have selected an item to import you will be asked to select where to put it in your Gallery. Select a folder and the file will be imported as a new Painting for you to select and paint on. If the painting is currently open tap the ArtRage logo button in the ArtRage toolbar and select ‘Export Image’. If you are in the Gallery, tap the painting you want to export once, then tap the Export button at the bottom of the screen (the button next to the Open button). If you want to export or share a normal image file other apps can understand, select the JPG or PNG type. If you want to export the full Painting file so that you can paint on it in another version of ArtRage, select the PTG type. 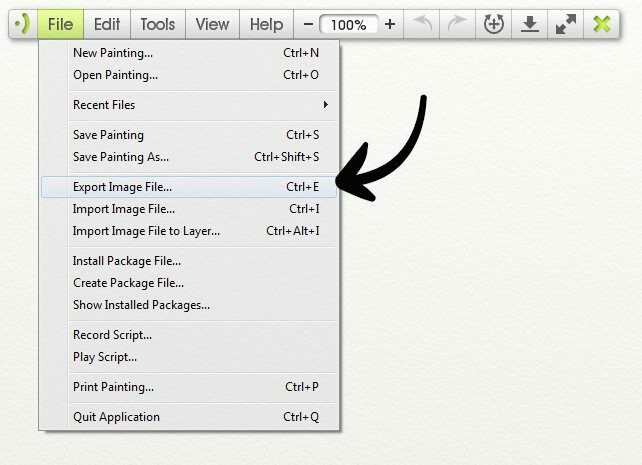 If you have been recording a script and just want to export the script from the painting, select the Script type. Once you have selected an export type, you will be asked to select a target for export using a standard iOS export picker. Only targets that understand the type of file you are exporting will be displayed. For example, if you export a PTG file only targets such as Mail or Dropbox will appear, as other apps don’t understand the contents of the file. Note: Most types of sharing (Facebook, Twitter etc.) require a normal image type, use PNG or JPG for this purpose. Select the target and the file will be exported. Open the main menu by tapping the ArtRage logo on the menu bar, then tapping ‘Gallery’ in the menu. Once in the Gallery, you can tap the Import Image button at the top right (looks like an image with a + at the top right corner). After selecting your image, a new painting will be add to the Gallery with this image as the first layer. If the painting is currently open tap the ArtRage logo button on the menu bar and choose the ‘Share’ option. If you are in the Gallery, tap the painting you want to export once, then tap the Share button at the bottom of the screen. ‘Export Image’ lets you export a JPG or PNG image to Android’s Pictures folder. ‘Share Painting’ allows you to share your painting file with other applications on your device. If you want to share a normal image file other apps can understand, select the JPG or PNG type. If you want to share the full Painting file so that you can paint on it in another version of ArtRage, select the ArtRage Painting type. If you have been recording a script and just want to share the script from the painting, select the Script type. Once you have selected an share type, you will be asked to select a target for sharing using a standard Android Activity picker. Only targets that understand the type of file you are sharing will be displayed. For example, if you share a PTG file only targets such as Gmail or Dropbox will appear, as other apps don’t understand the contents of the file. Link to this item: How do I Import, Export, and Share Images (iOS / Android)? How do I Import and Export Images (Windows / macOS)? You can import a standard image file to use as the basis of a new painting by opening the File menu and choosing ‘Import Image File’. Images can also be imported to existing paintings as a new layer by choosing ‘Import Image to layer’ in the File menu. After importing the image, you can scale, rotate and resize it, then either click the check button in the Transform window or press enter to confirm. To export your painting as a standard image file, open the File menu and choose ‘Export Image File’. You can select the type of image you want to export here. Link to this item: How do I Import and Export Images (Windows / macOS)? How to export / upload painting files? Why can’t I upload painting files to the internet or open it in other programs? If you wish to upload an ArtRage painting to Facebook, DeviantART, Flickr, or any other website, or open it with other programs like Photoshop, Gimp or MSPaint, then you need to export your painting. Why Does ArtRage Do This? ArtRage does not give you the option to save in different formats because the ArtRage PTG file is the only one capable of saving all of the media information for your painting. If you were to accidentally “save” your painting as a JPEG (for example), then you would lose layers, transparency, paint wetness, paint thickness, lighting direction, and canvas texture, as well as any attached References, Tracing Images, Color Samples or other ArtRage specific features. However, because you still need to use your paintings in other programs, it gives you a choice of formats to use to export a copy of your painting. Link to this item: How to export / upload painting files? Can I share my ArtRage paintings from the iPad? Can I transfer between the iPad and the desktop version of ArtRage? You certainly can transfer to and from the iPad. The iPad has a range of export options in three image formats (JPG, PNG, PTG). Choose the Export menu (the small arrow in the centre of the bottom menu bar) while in the gallery view to access the options. Record a Script on the iPad and play it back on the computer. You will need to start the script recording when you are creating the painting (in the canvas settings). You can only play it back on the desktop, but you can replay it as often as you need to, and stop it at any point. Exporting a script will appear as an option in the Export menu if a Script is available. Transfer files in and out of the iPad using iTunes (You can move files onto the iPad as well with iTunes). PTG is the ArtRage proprietary file type. This file will contain all the layers, depth and paint effects from your painting. You can import a different image file to work on, but it will not have layers or any of the special effects. JPG is the smallest file type and the most suitable to share online. If you edit JPEGs, you will lose a small amount of quality. PNG is the best file type if you wish to continue editing the painting in other programs. Link to this item: Can I share my ArtRage paintings from the iPad?